Spanning more than 200 years, this book comprehensively reviews the fascinating history of Washington County, Georgia, from its earliest habitation by Native Americans through its present day economical and social structures. The county’s lost towns are documented, as well as the history of its finest architectural structures. Personal memories of life in the County provide amusing and thought provoking anecdotes. 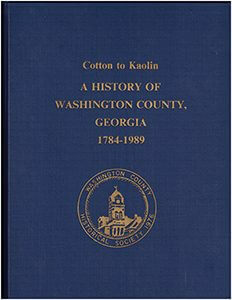 Many histories of prominent Washington County families are included.